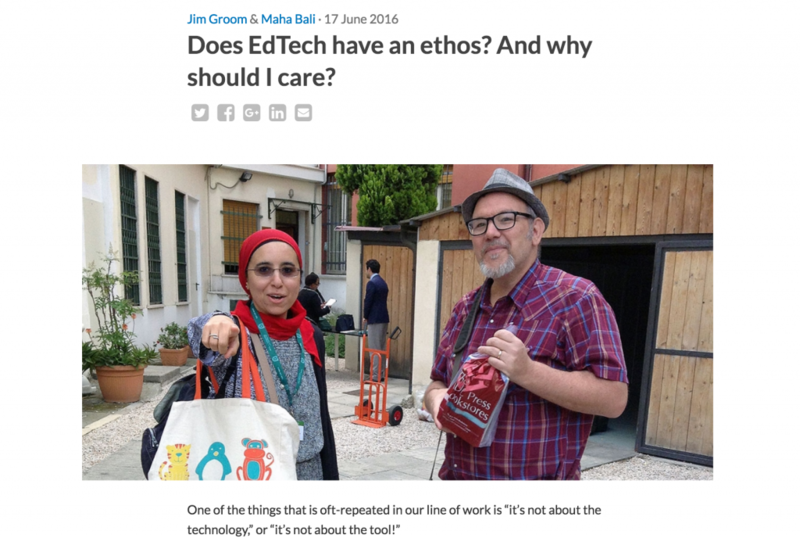 Does Ed-Tech have an Ethos? The dynamic duo at AMICAL conference brining the ethos hammer down! This is the question that guided the interactive presentation Maha Bali and I gave together at the AMICAL conference in Rome last month. We finally got around to write about that presentation for the AMICAL blog, and you can find that post here. I won’t go into too much detail because that’s why we wrote the post, but it was really a pleasure to both co-present and co-author with Maha. I’ve gotten quite used to the idea of co-teaching ds106 with folks like Martha Burtis, Alan Levine, and Paul Bond, but I haven’t yet perfected the art of co-presenting and, especially, co-authoring posts. I’m so used to being a lone blogger that writing with someone else seems unnatural. That said, the final product is usually much better given that you have to read, re-read, negotiate, and feedback. And Maha is uncompromising, and I like that about her—it’s what makes us a good team. Anyway, I particularly enjoyed this session because it brought into sharp relief (and directly challenged) the oft-repeated cliché “It’s not about the technology, “or “it’s not about the tool.” The idea of framing the session around the specific ethos of a tool we use like the LMS, Turnitin, Google Apps, etc., was all Maha’s, and I think it was an absolutely perfect frame for our session. We spent the session articulating—with the help of the audience—how the technology tools we use for teaching and learning have an embedded ethos and directly impact our practice. I like interactive, “in-your-face” sessions like this one, and we really benefitted from an engaged group of academics and librarians that were willing to take the challenge and push back accordingly. There is no progress without struggle! This entry was posted in presentations and tagged amical, Maha Bali, presentation, presentations. Bookmark the permalink. 1 Response to Does Ed-Tech have an Ethos?